SOCET GXP® groups capabilities in licensing bundles that can be purchased based on the requirements of your organization. If increased functionality is required, you can upgrade to the next bundle or add-on individual modules as described below. Contact a GXP® GXP sales representative or worldwide distributor in your area today for current pricing and to learn how SOCET GXP can benefit your organization or command. The GeoAnalysis Bundle contains advanced image and video visualization and exploitation capabilities. This includes image comparison tools (swiper, porthole, 2 color-multiview, and animation), hyperspectral and multispectral processing tools, LiDAR analysis, 3D visualization, Synthetic Aperture Radar (SAR) visualization, and annotation tools. In addition, users get access to a full suite of product generation functionality including chipping, output to PowerPoint, templates, Finishing Tool, and the publishing capability. This bundle also provides access to GXP InMotion™ Desktop which provides a comprehensive set of full motion video exploitation tools. The Extreme Analysis Bundle contains all functionality in the GeoAnalysis Bundle plus the following additional capabilities. The Activity Reporting Tool (ART) allows analysts to collect observations about a scene and store those in a database for future analysis. Automatic Feature Extraction (AFE) allows for automated extraction of 3D buildings (true 3D models, building footprints, and rooftops) and trees from a digital surface model or point cloud. Spatially Enabled Exploitation (SEE) and SOCET for ArcGIS® (SFA) allow for utilization of Esri® geodatabases directly inside of the Multiport (SEE) or concurrent extraction using SOCET GXP and ArcMap (SFA). Users can also triangulate imagery from multiple sources to improve accuracy, extract and edit terrain from stereo images, and generate orthophotos or ortho mosaics using this bundle. 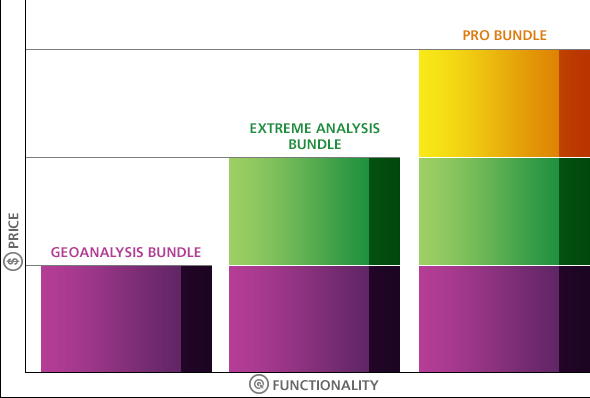 The Pro Bundle contains all functionality in the eXtreme Analysis Bundle plus the following additional capabilities. Volumetric feature collection provides the ability to model simple or complex urban structures to allow for 3D visualization in the SOCET GXP 3D Multiport. Users can also export 3D features to COLLADA and OpenFlight models. Image texturing is also included which allows for automatic application of image pixels to the 3D feature which enables a photo-realistic model. Clearflite® is a module that allows for vertical obstruction identification and extraction for airfields. In addition, the Advanced SAR module is included for free in this bundle. This module allows users to do interferometric processing using SAR imagery. A coherent change detection capability allows users to detect changes between two images (interferometric pair) utilizing the phase data inherent in complex SAR data. This module can be added to the GeoAnalysis and eXtreme Analysis Bundles. It is included for free in the Pro Bundle. The Workflow Improvement Module (WIM) allows users to connect to a GXP Xplorer® or GXP Xplorer Disconnected catalog directly from the SOCET GXP Multiport. This allows for search and discovery of an organization’s holdings without ever leaving the SOCET GXP user interface. The WIM also enables use of the gazetteer to enable jumping to placenames in SOCET GXP. This module can be added to all license bundles (GeoAnalysis and above). This module enables the creation of a georegistered PDF file (GeoPDF) from imagery and features loaded into a SOCET GXP Multiport. GeoPDFs output from SOCET GXP have the ability to contain multiple layers that can be subsequently toggled on and off. Users can view coordinates and make measurements on these output products in a standard PDF reader. This module can be added to all license bundles (GeoAnalysis and above). 3D GeoPDFs allow users to view and manipulate a 3D scene in a PDF reader. These are geographically referenced. The 3D GeoPDF functionality allows terrain, features, and imagery to be exported from the SOCET GXP Multiport. The ability to generate 2D GeoPDFs (TerraGo 2D GeoPDF Publisher for SOCET GXP Module) is included in this module. This module can be added to all license bundles (GeoAnalysis and above). The SEE capability allows users to connect to an Esri GeoDatabase directly in the SOCET GXP Multiport. Users can extract features directly into the database. SOCET for ArcGIS (SFA) is also included in this module which allows for SOCET GXP to run concurrent to ArcMap and users can link the two applications so that features can be created, attributed, and modified in either application. The Activity Reporting Tool (ART) is also included. This allows users to extract observations about a scene and store these into a database which allows for trend reporting and analytics based workflows. Users can also publish to Esri portal with this license. This module can be added to GeoAnalysis. It is included for free in the eXtreme Analysis Bundle and the Pro Bundle. Digital Point Positioning Data Base (DPPDB-like) and Controlled Image Base CIB (CIB-like) generation provides the capability to generate DPPDB-like and CIB-like specification products from commercial imagery sources. This module can be added to the Pro Bundle.